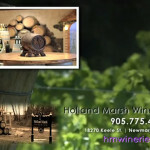 Situated just outside of Newmarket in a historic farming community, Holland Marsh Wineries merges old world winemaking techniques with the finest quality grapes grown in the Marsh. The unique composition of the soil gives the grapes an unparalleled distinction from that of any other Ontario location. Tuesday to Saturday: 10:30 a.m. to 7:00 p.m.
Sunday 10:30 a.m. to 6:00 p.m.